Foundation upheaval is responsible for 70% of all foundation failures in the US. The annual US cost for damage due to expansive clays is more than $1 billion. Expansive Soils: Different types of soil are affected by moisture in different ways. Clay soil is the biggest problem soil because it expands and contracts as the amount of moisture in the ground increases and decreases. Clay soil contains minerals that can absorb moisture and cause the soil to increase in volume. The more moisture that is absorbed, the more the volume increases. This change in volume is significant and can exert force on a home that causes major structural damage. Swelling soils can cause major damage to a foundation such as cracks, bowing or buckling walls and uneven concrete slabs. Swelling soils can also cause damage to upper floors of a home by cracking drywall, making floors uneven, and making doors and windows hard to open and close. Lifting foundations can break pipes and sewer lines running through the floor and underneath the foundation. That moisture will cause the soils to swell and lift even more. Plumbing Leaks: Leaks or breaks in plumbing lines that run underneath a concrete slab can cause the soil under the slab to swell and lift or "heave." This heaving can cause major damage, especially when partition walls on top of the slab are pushed upwards, causing damage throughout the house. Dry Soils During Construction: If your home was constructed during a time of very dry soil conditions, the soil's potential for expansion is especially high. When dry soil absorbs moisture, it causes it to increase in volume and expand. When this happens it can lift and heave your floor slabs and cause damage. Frost Heave: Persistent cold weather causes moisture in the ground to freeze. As soil moisture freezes, it expands by about 4% of its volume, resulting in heaving of the soil. 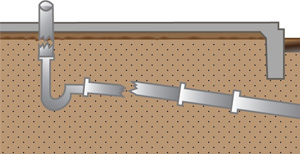 This heaving can exert a large amount of force onto your foundation and cause it to shift and crack. Prolonged or Heavy Precipitation: Prolonged or heavy precipitation will naturally lead to increased moisture underneath your foundation. This precipitation may be absorbed by the soil and lead to heaving of your foundation and interior slabs. Foundation Supportworks of the Tri States would like to help you address and repair any foundation issues your home may be experiencing. We offer homeowners within our service area FREE, no-obligation foundation inspections and written quotes. If you have a failing foundation, call or contact us today! We can help with your foundation repair issues in Peoria, Quincy, Pekin, Galesburg, Burlington, Ottumwa, East Peoria, Hannibal, Macomb, Canton, Oskaloosa, Fort Madison, Keokuk, Fairfield, Mount Pleasant, Monmouth, Washington, and the surrounding areas in Iowa, Illinois, and Missouri.